PrettyFit is a women’s fitness and health subscription box. You can preview the boxes before they ship and skip any month you aren’t interested in. You can also request to receive a different pack if it is still available, instead of the current month’s pack. COUPON: Use codeMSASPECIAL15 to get $15 off your order. 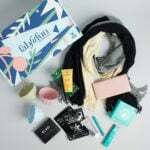 Check out the Women’s Subscription Box Directory for more great health and fitness subscriptions, or see our past reviews of the PrettyFit box. There was no information card. I’m not sure which box this was, actually, because it doesn’t precisely match any other reviews I’ve seen (though there is some product overlap) or any of the packages still available on their site. It might be the Spring Protein Pack, which is no longer available, but with some product substitutions from past boxes. The box it arrived in was (heavy) plain cardboard. There wasn’t any packing material, as you can see from the photo above, but it wasn’t really necessary to include any because of the types of products in the box. These B Up Bars have a strange texture. If you have ever had the orange candy called “circus peanuts” and you imagined it but a bit stickier/denser, you’d get pretty close. These are uniform in texture and they do taste like peanut butter although the flavor is mild. The Amrita bar is free of the 8 major allergens. (Actually, both types of bar in the photo are gluten free). These are also raw and vegan. They’ve been reformulated to contain less sugar and they do taste pretty much like date bars (but with a little crunchiness from sunflower seeds). All of these are gluten free, as well. The B Up bar minis have the same texture issues as the full size peanut butter ones up above. The sugar cookie one is vaguely sweet but doesn’t really taste like sugar cookies. The chocolate mint one is pretty minty. I don’t hate them, but they’re not the best protein bars I’ve ever had. And the texture may be a personal preference thing. The Protein D’Lites, however – I think those are delicious. Like I would eat them voluntarily, and probably in excessive amounts, even though I don’t need to eat GF. They are a little high in sugar for being so small, which is probably what I like about them. I listed values based on the full size purchase price but you will notice that all the packets say “free sample” across the top. I don’t know why chocolate and vanilla have different prices (the package weights are also different). These are gluten free as well. I think the quinoa is a really interesting protein source, and one that I haven’t seen before. My standard method for testing protein powder is to mix it up in vanilla almond milk according to the package directions. This dissolved well in the suggested amount of liquid without caking the bottom of my cup with residue. The flavor was just a touch strong for me (I’ve only tried chocolate so far) but not bad. Syntha-6 chocolate is my favorite protein powder of all time (thanks to subscription boxes, I’ve tried a lot), so I have high hopes for the vanilla. Best I can tell, neither of these are gluten free (but then, the box does not advertise itself as such). The ProLifeStyle supplement is interesting. First you mix up the powder part and then you can add as much or as little liquid as you want. I found that about 2/3 the given amount was enough for me. These are supposed to taste like s’mores and I did kind of get a graham cracker vibe from it, but it wasn’t very chocolaty. This is big. It’s why the box was so heavy and it’s not even full size! But 2 pounds is more than enough. I made a shake with this and it really did feel (to me) like I was drinking cake batter. But it dissolved well. (One thing I would highly recommend is using an immersion blender or some other electric means of mixing any of these protein powders in. I get so much better results that way than by trying a shaker cup or stirring.) I think I am going to seek out some recipes to use this in. Because there is a lot of it. This one is gluten free and has some digestive enzymes and vitamins in it, as well. I really like the simplicity of the ingredients list for this cacao brittle. It tastes mostly of banana to me. I just ate it right out of the bag but I have heard of putting it yogurt, etc. This one is raw and gluten free. I’ve gotten samples of this detergent before and liked it. I will probably use it for towels because it is powder and I think powder detergent dissolves better in hot water. I listed a price but on the Rockin’ Green website, you can buy this with free shipping and get a coupon for the purchase price off your next order, so it’s kind of free. Verdict: I calculated a value of about $74 for this PrettyFit box. It could be a little lower because some of the items are available as free samples. Because I couldn’t figure out which pack this was from their site, I can’t compare with a value stated by the company. I also note that some of these prices I listed were sale prices from GNC and Vitacost, rather than MSRP. One thing that is important to note is that the value is considerably higher than the cost of the box, which is great for a box with mostly food items. I’m happy with the variety of items and I’m completely fine with so many whey protein products (most of the powders/mixes) because, personally, that is my favorite type of protein to supplement with. I find that it mixes in with liquid better than other types. This particular box would be good for vegetarians (but not vegans, since so much of the protein is whey protein) and maybe also people who eat gluten free (although not every product was certified gluten free, so this may be better for households where some people eat GF and some don’t). What did you think of the June PrettyFit box? This is actually the “Spring Protein Pack”. It came out around March/April. The pack that they’ll be sending out for the month of June, is the “Fitmiss Pack”. This looks like a great box to try bars and powders since I need to find some I like. However, the price is a little high for me right now. Does anyone know of a good box similar to this one that costs less? I have subscribed to Pretty Fit for almost a year now and am very pleased with my monthly boxes. I have the Protein Powder every morning for breakfast and have been able to go thru the larger container without any problems. I also appreciate that if you don’t think the monthly box is for you, you can skip. So far I have felt the value of each box has been at least double what I have paid and that works for me. Pretty Fit’s customer service has also been very quick and helpful. I have been trying to eat smaller meals due to acid reflux so I am mostly using the protein powders as breakfast, as well. It’s good to know you’re getting through it. I think that is the largest container of anything I’ve ever received in a subscription box! The Pretty Fit box that had the cookbook for Protein Powder was one of the best if it is still available. Sometimes I eat a late lunch so will also have a protein drink for dinner. Controlling acid reflux is so important as it can create awful problems. Check out “Foxy Boxes” it’s similar but the pricing looks better! I had cake batter frozen yogurt last time I went out for fro-yo with my daughters. It was delicious! I think I would like the protein powder. It would be nice if they sold it in serving size packages (maybe they do) for those days you had a big workout or maybe didn’t get enough protein in your diet. I wouldn’t want a HUGE jug. Yeah, I am not so sure what I am going to do with the whole jug. I might freeze some individual portions just so it doesn’t cake together, picking up moisture the longer it’s open. (And this is only 40% of the full size!) I am also going to try it in pancakes because I always want more food about an hour after I eat pancakes and I thought maybe the protein would help keep me full for longer. I notice the items I liked best were the sweetest ones, although the protein powder has sucralose instead of sugar, at least.